One Days Training Session with Labour Department and Police Officials Organized by LEF in Lahore. One Days Training Session with Brick Kiln Workers Parents & Children Organized by LEF in Lahore. Two Days Training Workshop with Brick Kiln Union Members Organized by LEF in Lahore. Two Days Training Workshop with Brick Kiln Workers Organized by LEF in Nankana Sahib. Two Days Training Workshop on OSH with Brick Kiln Workers Organized by LEF in Lahore. Two Days Training Workshop with Brick Kiln Union Members Organized by LEF In Sheikhupura. Seminar Organized by LEF in Lahore on topic of "Environmental Issues and Possible Solutions"
Seminar Organized by LEF in Lahore on topic of "Stop violence Against Women in Brick Kiln Industry"
International Labour Day Rally organized by LEF in Lahore! Labour Education Foundation (LEF) organized a two days capacity building training workshop for the learners of skill centres of Labour Community Organizations on 8-9 November 2016 in Lahore. Total 33 participants (25 girls and 8 boys) and their teachers attended this training. The main objective of this training was to enhance their knowledge on subjects like basic business traits, gender, environmental issues and socio economic situation in country. 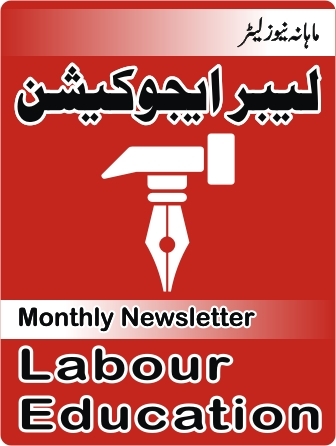 Organising of women garment workers is very important for development of the labour movement in Pakistan. LEF is trying to train garment workers and organise them in union in few districts in Pakistan. "End Child Labour in Supply Chain"
Labour Education Foundation in collaboration with Solidar Switzerland and Group Development Pakistan observed the World Day against Child labour on 28th July 2016 at Pak Heritage Hotel, Lahore was arranged a seminar. 259 were participation including children and community. The representatives of local and national organizations also participated. Speakers talked about the present situation in terms of child rights, reasons behind child labour, importance of education for children and the role of government to deal with the situation. A puppet show was arranged by "GODH". Children from the non-formal education centres established under the project “Piloting an Intervention to Counter Child labour in Slum of Lahore” described their thoughts about the issues related to child labour. CRM Punjb arranged a session for children at Labour Education Foundation's NFE center in Ahmad Town Lahore to make them aware about the existing laws for the protection and promotion of their rights. Session led by Ahmar Majeed Advocate High court and child Rights expert. Labour Education Foundation (LEF) organized a capacity building training workshop for members of Labour Community Organizations (LCOs) on 18-19 May, 2016 in Pak Heritage Hotel, Lahore. 25 participants (14 women and 11 men) attended this training. Trainers highlighted the objectives of forming and strengthening 10 LCOs in two districts, Lahore and Sheikhupura, how to increase membership and membership fee, importance and techniques of advocacy campaign for people’s rights, social, economic and political situation of Pakistan, requirements and method of registration of organizations with government, women’s role in developing organizations and issues of areas through presentations, discussion, group works and mapping. 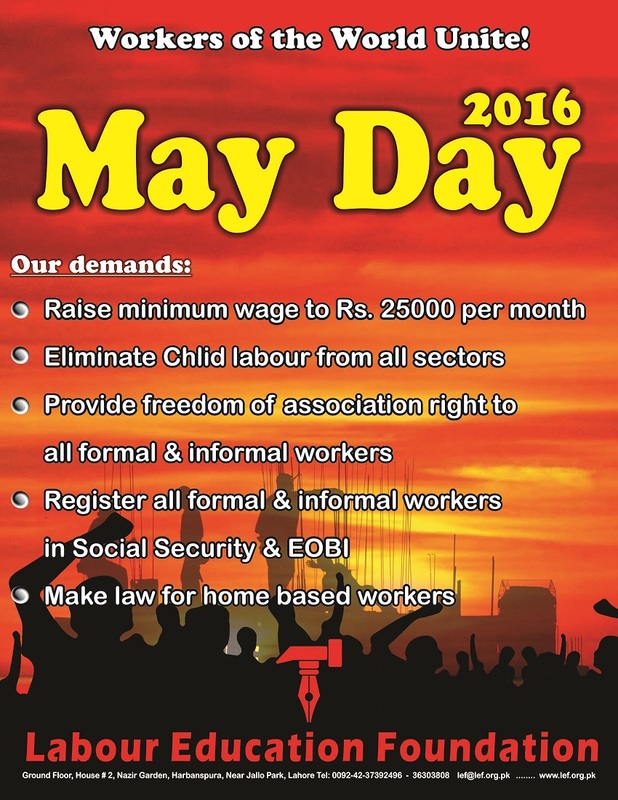 Labour Education Foundation (LEF) organized a rally of Home Based Workers (HBWs) from Shimla Pahari to Punjab Assembly, Lahore on "International Labour Day" (1st May), 2016. More than 200 HBWs participated in this rally and chanted slogans, recognize HBWs as labour, pay wages according to work, ratify convention 177 of HBWs etc. Child Rights Movemnet had a press confernce to demand Increase budget to address Child Rights isues in Punjab. Children are 47% of our total population receiving 1% of public investment; we cannot imagine a bright future for our country without giving their due share in resources. 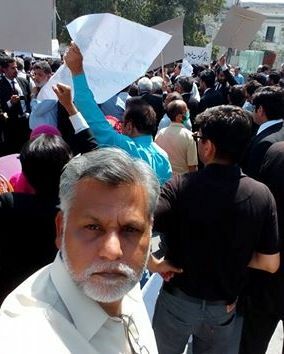 Supreme Court of Pakistan 3 judges Bench has reinstated me and my friends with all back benefits.I am grateful to you all,you ever encouraged me during my dismissal period which was sole for working class. Its for your kind information and Love. Today was a global call day for showing solidarity with Ali Enterprises victims for paying full compansation and justice to families of 256 workers died in the fire incident. In this regard, Textile Powerloom and Garment Workers Federation and Labour Education Foundation today held a demonsration in fron of Lahore Press Club. Even after 3 years the victims' families are not paid full tong term compansation and the German company KIK Textilian has gone back from its initial promise to pay full compansation. Even the government of Pakistan has not been very active to give justice to the families and the responsible for fire and situation created after fire are not being put behind bars. We demand that KIK pays full long term compansation to the families, government should take effective measures to improve factory inspections and implementation of labour laws. Textile powerlooms and garment workers federation Pakistan hold a press conference on 06 April for the reinstatement of sake textile garment workers.Pakistan textile workers federation general sectory Usama Tariq, Ittifaq mazdor union cresent bahuman pindi bhatian president Gulam Abbas, Gen Sec. Khalid Mehmood. 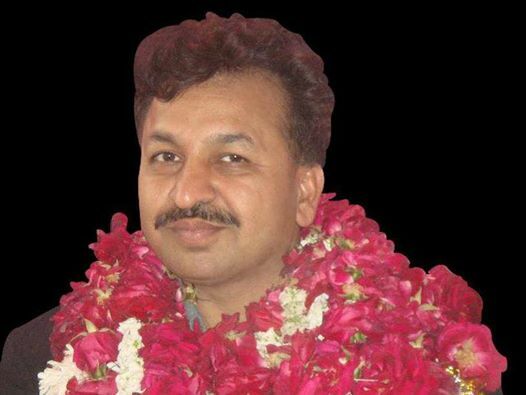 Ali Murtaza Associate private limited workers unions Gen Sec. Farhad Shukat and M Asif. Lef director khalid mehmood was also their. TPGWF gen sec. Niaz khan said that Cresent bhuman pindi bhatian and Ali murtaza associate workers should be reinstate and give them freedom to organize trade union.TPGWF will organize rallies and protest with orther unions in Lahore,Faisalabad,Multan and Hafizabad. 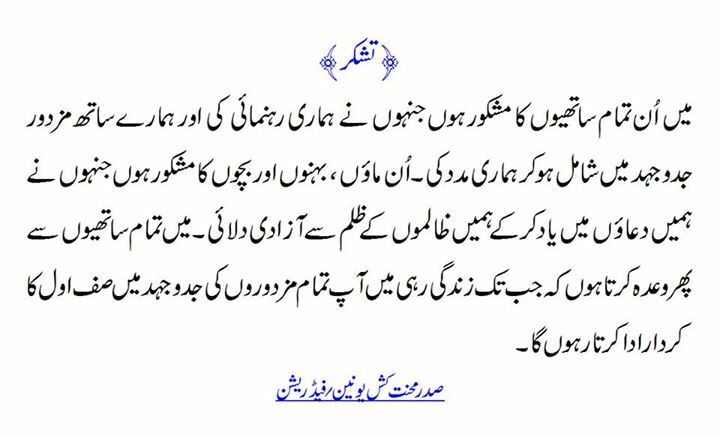 Khalid Mahmood Director Labour Education Foundation (LEF) writes that "Progressive Forces Must Unite Against Extremism and Militancy in Pakistan"
30 April at 6pm at Aiwan Iqbal Lahore, Egerton Road Lahore with known poets and artists, Habib Jalib birth day celebrations on 24 March 2016 at Lahore Press Club. 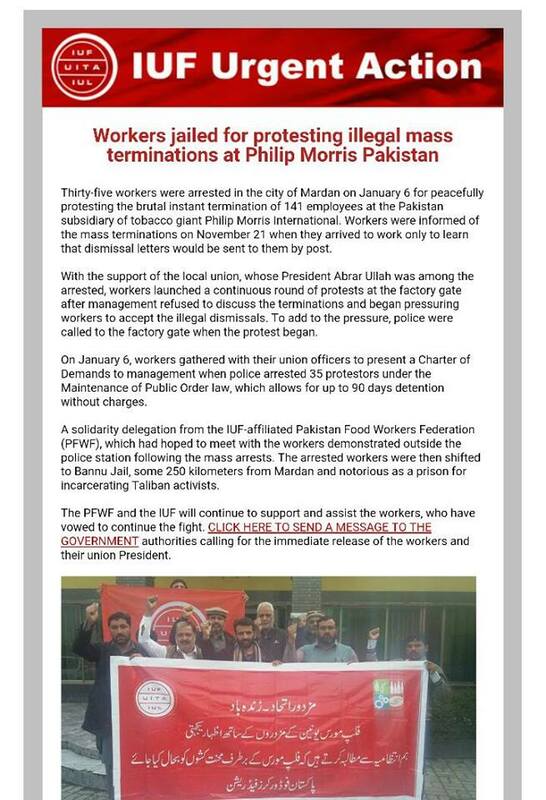 Arrested trade union leaders and members of Mehnatkash Union Philip Morris released by KPK government due to pressure of solidarity campaign by trade unions, AWP and IUF. Friends please send protest letters to KPK government over arrests of union leaders of Philip Morris Tobacco Company; click the link below. Please Send the protest massage to KPK Government aginst the Arrestment of Philip Morris Worker's and Leaders. No to Child Labour, Yes to Quality Education! Labour Education Foundation in collaboration with Solidar Switzerland and Group Development Pakistan observed the World Day against Child labour on 12th June 2015 in Ahmed Town, Lahore by organising a seminar. Approximately 350 persons including children were participated in the seminar. The representatives of different political parties, local and national organizations also participated. Speakers talked about the present situation in terms of child rights, reasons behind child labour, importance of education for children and the role of government to deal with the situation. A puppet show was arranged by the Zoom Theatre. Children from the non-formal education centres established under the project “Piloting an Intervention to Counter Child labour in Ahmed Town” described their thoughts about the issues related to child labour and reiterated their aim to get education. 11-12 June, 2015: Labour Education Foundation organized 2 - day Provincial leadership training workshop for home based women workers in Mardan. Members and Office Bearers from Home Based Women Workers Union KPK contributed actively and took some decisions to enhance union membership and structuring bodies at district level by drawing future strategy. Labour Education Foundation (LEF) organized two days training workshop for capacity building of members of Labour Community Organizations (LCOs) on 21- 22 May, 2015 in Lahore. 25 members of LCOs from different areas of Lahore participated in this training. The speaker discussed about objectives of LCOs and importance of organizing at community level to bring social change in their lives. Members are motivated to participate in Local Bodies Elections for political change so that working class could resolve basic issues of communities by presenting at decision making levels. They were also convinced to put pressure on government departments, political activists and government of Pakistan for their basic rights by lobbying. The trainers emphasized the need of women participation not only as members but also as office bearers in LCOs as they have a vital role in social and economic development; we can’t progress without women’s participation. Lahore: There is a common threat of religious fundamentalism and imperialistic occupation to the progressive forces in Pakistan and Afghanistan and there is a need for common strategy to combat this challenge, this was the outcome of a two-day conference of progressive parties of Pakistan and Afghanistan organised by the Labour Education Foundation on March 12 and 13. Speaking at the concluding session of the conference, Awami Workers Party general secretary Farooq Tariq said a common strategy was required to fight religious fundamentalism on both sides of the border. He said the government of Pakistan must not terrorise those Afghan refugees living peacefully in Pakistan for several years. Refugees who have not received identification documents must get them without delay. “There is no good or bad Taliban,” he said. 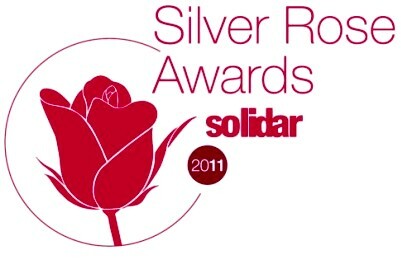 Terrorism must be fought vigorously by progressive forces on both sides. Labour Education Foundation (LEF) organized a seminar to commemorate “International Women Day” on 8th March, 2015 in Ahmed Town, Lahore. 110 Home Based Women Workers (HBWWs) participated in this seminar. The importance and significance of the International Women’s Day was highlighted, the struggle and efforts of women workers in economy and to improve their working conditions were appreciated. Along with describing the situation of HBWWs, demand to ratify and implement the ILO convention 177 was repeated. The law of sexual harassment at the work place, harassment at public places, violence against women and laws for protection of women were also shared in this event. Women participated enthusiastically though there was heavy rain and hailing in Lahore. 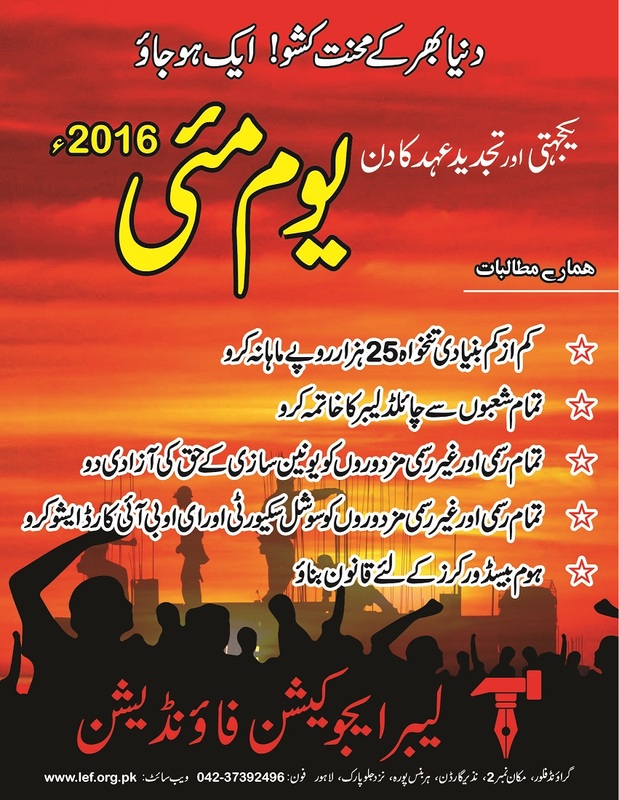 Excelent Faiz Amn Mela this year! Despite Pakistan India world cup cricket match today the open air auditorium was full of audience. A beautiful poetic drama "Heer" was presented by drama activists. Poetry session, a regular feature of Mela was very emotional as poets paid tribute to children of APS Peshawar. Challenging religious extremism is not a new phonomenon in poetry in Pakistan but today Faiz Mela brought prominent progressive poets together to renew the promise of fighting fundamentalism. Laal Band, Jawad Ahmed and Inayat Abid sang Faiz and motivated audiences. Farooq Tariq, general secretary Awami Workers Party spoke of bring real change in Pakistan by building working class movement. Lots of young peoples' participation in this year's Faiz Mela was a prominent feature. I thoroughly enjoyed taking pictures whole day in this wonderful event! LEF Seminar "Current Political Situation and Workers' Rights"
LEF organised a seminar today in Lahore on "Current Political Situation and Workers' Rights". Asma Jahangir, Salman Akram Raja, Farooq Tariq, Niaz Khan, Amir Sohail, Aslam Meraj, Nazli Javed spoke. Establishment of military courts was strongly opposed by all speakers. 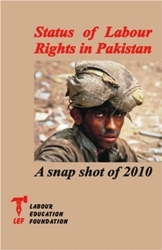 Lack of political will by government to impliment labour laws was criticised by labour leaders. Importance of workers participation and developing workers own politics was emphacised. Workers of formal and informal sector from different areas of Lahore participated in the seminar. SASK and APHEDA visit to carpet washing factory, warm welcome by Ittehad Labour Union Carpet Industries Pakistan! Home Based Workers of Lahore and their work! Labour Education Foundation organized a seminar to commemorate the campaign of "16 Days of Activism Against Gender Based Violence" in area of Khuda Ki Basti on 3rd December, 2014. Approximately 300 women attended the seminar. History, importance, significance and relevance of the 16 Days of Activism Against Gender Based Violence was shared with the audience. 25 November as internationally day to eliminate all types of violence against women, 10 December as human rights day and legal protection against sexual harassment was described. Community activists organized a theater play to highlight the issue of domestic violence. T4-day wonderful visit of Sindh, met brave home based women workers leaders and activists in Hyderabad and Moro, trade unions of Nowshehro Feroz coming together to form a Trade Union Coordination Committee. Difficult political and social situation for women and trade unions but things are moving, thanks to handwork of some committed comrades. Another good report by Shehryar Warraich! This is about discrimination with female brick kiln workers.